We are getting ready to travel to Rhode Island for our Easter break. To get there we fly approximately 6.5 hours to Boston from Dublin. 6+ hours with 2 toddlers is never easy, despite the copious amounts of snacks packed & numerous new apps loaded onto the iPads. I also always try to bring a new toy for each child. Just something small and inexpensive but new because I find that usually the first time playing with a toy often ends up being the longest they show interest in it!! For this trip I'm trying to be slightly more organized than usual and put that tiny bit of extra effort behind the travel plans. I recently was browsing Pinterest and came across a Red Ted Art project to make a foldable cardboard dollhouse. Immediately I thought it was a perfect project to help me have that edge I need for this upcoming trip! Emme is currently at an age where she is slightly obsessed with all things miniature. 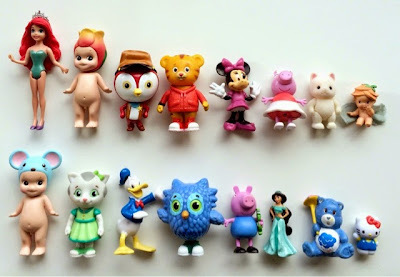 We have tiny animals, little Sylvanian creatures, small cartoon characters, Kinder Egg sized princesses and any other figurine that she can fit in the palm of her hand. I'm thinking that this collapsible dollhouse will compliment her collection of miniatures. We'll fill a small bag with loads of toys & this new dollhouse to occupy her at restaurants, in waiting rooms and hopefully, on airplanes and at airports too! For this project you will need a few common household items including two cereal boxes, glue sticks, duct tape, scissors and some paper. The creator lists easy to follow, step-by-step instructions but she does us non-artistic types one even better by providing downloadable furniture printables which are available through the Red Ted webpage. I simply printed out the two sheets of furniture drawings, cut them out and pasted them onto the walls. My favourite part about this dollhouse is that it all folds up into a neat, little stack. I'll tuck it away in Emme's backpack on the plane. With each room measuring 5.5" square, this dollhouse's footprint should easily fit onto the drop down table top at her seat. And while I made this house specifically for our upcoming trip, I know that Emme will have big plans to reuse it again and again! What a tidy little package! This version is slightly smaller with 4' square rooms and it has a zoo theme, featuring hand drawn giraffe and monkey exhibits, a Zoo entrance sign and directional signage too. I've added a couple of miniature plastic animals in his carry-on bag to play with. Emme caught sight of this version earlier today and was already asking to play with it so I think they'll both go over a treat! Do Gorillas & Chimpanzees usually hang out together?! Which way to the Wild Safari? I couldn't BARE to have only made a dollhouse for Emme! Viewing from a safe location! Once again, I absolutely love this project! Simple, quick and fun! Let me know if you make any of your own versions. I would love to see them! We've returned from our trip and I have to say that these two projects were a big hit! Hooray for Red Ted Art! I found that Emme's was a little large for the plane because we were in the bulkhead row which uses the tables that pop out of the arm rest and they seemed to be a wee bit smaller than I remember the drop down tables being. However, we used them in the airport too & they worked perfectly! At one stage the kids had them side by side so that the "friends had a zoo in their backyard". I love witnessing how they use their amazing little imaginations!!! A cute idea for Harry would be a zoo one. The animals are also small enough for travel. Yes! I love that idea! I'm working on a smaller version for Harry now and the animals at the zoo would be great!! Thank you! I loved your idea so much that I just had to make one!!!!! Thanks again for the great idea! That's a successful craft project! Looks like the 6.5 hours will fly by now! I am intrigued with the doll with the mouse cap, super adorable. The zoo came out great. They will have a ball with them. Oh I think I'm going to enjoy these also! Excellent job Erin! Thank you! It was fun to make and the kids love playing with them! I came to this post from the link from Red Ted Art's page. The original idea and the way you developed it, both are amazing. Nice Blog, I really Like it. Thanks For Sharing.we can help you with any packaging requirements no matter how big or small. If you have encountered a company that wants you to order hundreds of boxes at a time.Contact Us: Cheap cardboard boxes Christchurch 0800 359 9313.